Home / #AmericanRoadRadio / #Russia / #Soccer / #SocialMedia / #TrueNews / Russia / scandal / soccer / Sport / #Soccer : Here you can see the parade of the ten worst frauds by players in #WorldCup ! #Soccer : Here you can see the parade of the ten worst frauds by players in #WorldCup ! Here you can see the parade of the ten worst frauds by players in World Cup ! Brazil may have beaten Costa Rica 2-0 in their group match but instead of being remembered for the drama of two late goals, all everyone could talk about was Neymar's infamous dive. With the match goalless, Neymar flopped dramatically on his back in the Costa Rica penalty area. While he initially conned the referee, who awarded a penalty, the VAR team quickly overruled after seeing that he had barely been touched by Costa Rica's defenders. His antics immediately sparked an avalanche of memes. “Who does Neymar think he is? Neo? The Matrix has found its new actor,” said Twitter user @Nota_Steve. VAR will continue to have its work cut out in Russia as, when it comes to a World Cup, it has been seen time and time again that players are prepared to do whatever it takes to get an edge over the opposition. So Al Jazeera’s lists the World Cup's top-10 cheating moments. The parade of the ten worst frauds by players in World Cup ! It's Brazil's 2014 World Cup opener at home against Croatia. Score is locked at 1-1. Just 20 minutes left on the clock. Nerves are jangling all around the Arena de São Paulo. Enter Fred. Receiving the ball in the penalty area with his back to goal, the striker flung himself backwards into Croatia's Dejan Lovren and rolled around on the ground. Despite the blatant dive, Japanese referee Yuichi Nishimura pointed to the spot. Neymar converted. Brazil went on to win 3-1. The Croats were knocked out in the group stages and manager Niko Kovac darkly suggested Brazil might as well be awarded the trophy already if referees were going to be so biased. Few expected Diego Maradona to leave a huge impact on World Cup 1994. The genius who inspired Argentina to glory in 1986 was now overweight, injury-prone and unequivocally past his peak. But in Argentina's 4-0 win over Greece, Maradona appeared markedly slimmer. The graceful balance and silky dribbling had miraculously returned. After putting his side 3-0 up with a left-foot rocket in the top corner, he charged screaming towards the cameras, wild-eyed and veins bulging. A week later, Maradona tested positive for the stimulant ephedrine and left the tournament in disgrace. England trailed Germany 2-1 in a 2010 World Cup second-round clash. But they looked to have levelled when Frank Lampard lashed an opportunistic half-volley against the underside of the German crossbar. Despite TV replays showing the ball bounced down and over the line by at least a yard, referee Jorge Larrionda refused to award a goal. 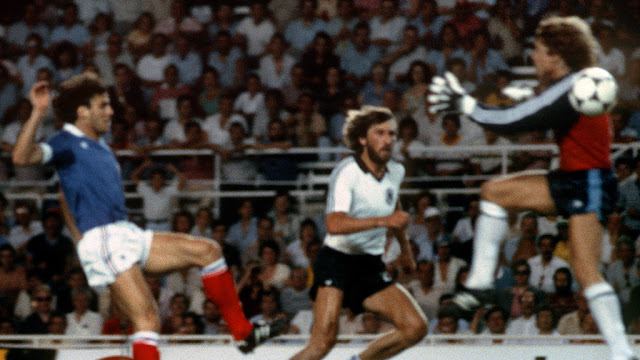 The final group 2 match of the 1982 World Cup between West Germany and Austria saw both teams knowing a one or two-goal win for the Germans would see them qualify for the second round ahead of Algeria who had played their final match a day earlier. Once West Germany took the lead after 10 minutes, the match effectively ended as a spectacle with both sides filling out the remaining 80 minutes by passing the ball around within their own halves. 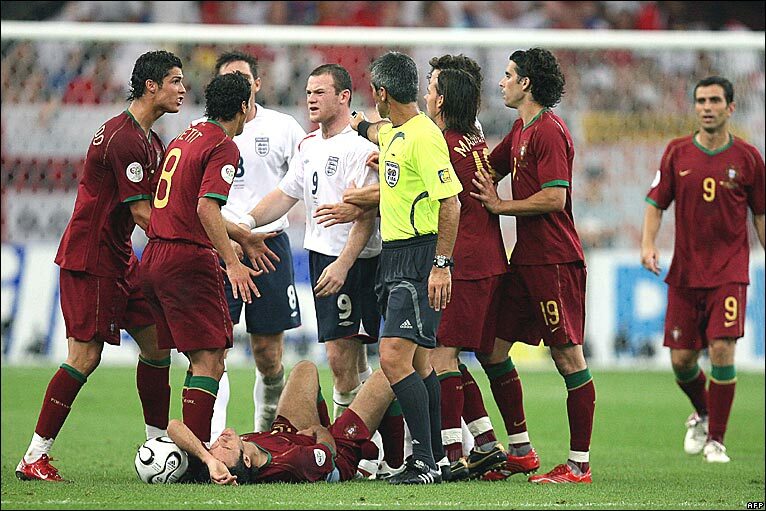 Portugal took on England for a place in the 2006 World Cup semi-finals. With the game goalless after 62 minutes, Ronaldo was seen trying to persuade referee Horacio Elizondo to send Wayne Rooney off, after seeing the English striker appear to stamp on Ricardo Carvalho. TV cameras then caught Ronaldo winking at coach Luis Scolari after Rooney was given the marching orders. Portugal went on to win on penalties but relentless abuse was hurled in Ronaldo's direction at all Manchester United's games the following season. West Germany's World Cup 1982 semi-final with France would permanently change the lives of two men: German goalkeeper Harald Schumacher and France defender Patrick Battiston. Early in the second half, Michel Platini lofted a pass through the German defence, setting Battiston in on goal. The Frenchman looked set to score only for Schumacher to charge out and deliberately collide with Battiston midair, knocking him unconscious, breaking his teeth and ribs. Battiston suffered permanent damage to his back. Remarkably, Schumacher's act went unpunished. And the nature of the foul and Schumacher's complete lack of remorse – he later coldly remarked he would "pay for the crowns" - saw him vilified across France with effigies of the German being hung from lamp posts. 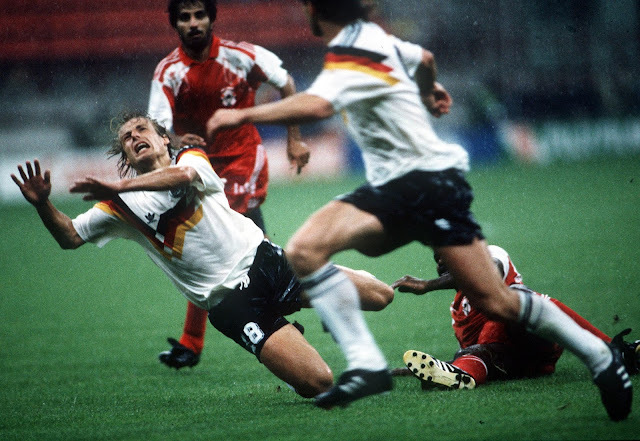 One of the greatest strikers of his generation, Jurgen Klinsmann was also dogged by controversy over diving, most notably in the World Cup 1990 final against Argentina. In what became the defining image of the final, Klinsmann was caught by Argentine defender Pedro Monzon and proceeded to launch himself theatrically in the air, before rolling across the turf. The performance convinced the referee to immediately send off Monzon, making him the first player to be sent off in a World Cup final. West Germany capitalised and won with a late penalty. Klinsmann's reputation as a master of the dark arts was complete. A key member of Brazil's 2002 World Cup winning side, Rivaldo should have been remembered for his slaloming runs and bending left-footed strikes. Instead, he besmirched his legacy with deliberate play-acting to get Turkish defender Hakan Unsal sent off in their 2002 match. With seconds left till the final whistle, Rivaldo went to take a corner kick and Unsal chipped the ball towards the Brazilian. Video replays showed the ball struck Rivaldo on the knee. 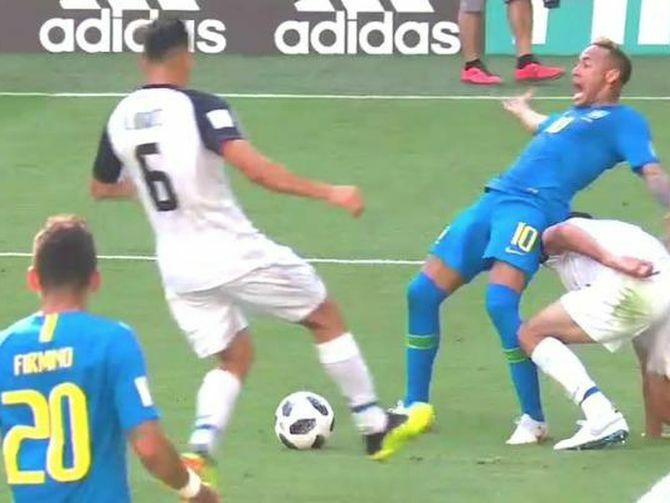 Instead, the Brazilian went down clutching his face, rolling around in apparent agony and to Turkey's fury, Unsal was shown a red card. FIFA's post-match investigation saw Rivaldo fined $7,350 but he was, controversially, allowed him to continue taking part in the tournament. 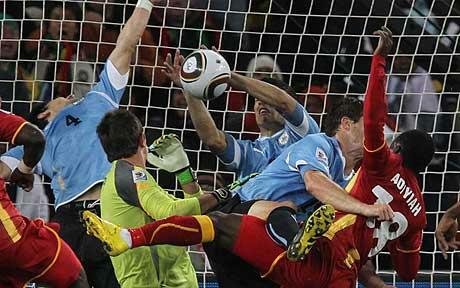 Luis Suarez's reputation as a football villain began in 2010 when he denied Ghana a place in the World Cup semi-finals in the dying seconds of their quarter-final clash. He palmed Dominic Adiyiah's goal-bound header off the line, volleyball style. An immediate red card followed but amid the tension, Ghana striker Asamoah Gyan blazed the resulting penalty against the crossbar. TV cameras showed Suarez pumping his fists in jubilant celebration, Uruguay went on to win on penalties, and the entire African continent was left enraged. Despite receiving death threats, Suarez later said he'd do it all again if needed. This is the most iconic piece of skulduggery in football history. Coming at the height of the Falklands War, the 1986 quarter-final between England and Argentina was always going to be tense. But then Maradona gave his side the lead in notorious style, leaping to challenge England's Peter Shilton for a ball in the penalty area, and using his left hand to punch it over the keeper and into the open goal. As he wheeled away, he later revealed he had to urge his team-mates to feign celebration, saying, "come hug me or the referee isn't going to allow it". To England's fury, the referee Ali Bin Nasser let the goal stand, claiming he did not see the handball. Argentina went on to win 2-1 and eventually lifted the trophy. Maradona famously described the goal as "a little with the head of Maradona, and a little with the hand of God". England manager Bobby Robson had a different perspective, commenting, "it wasn't the hand of God, it was the hand of a rascal".